Honestly, I didn’t know if I would succeed or not. There were little moments when I did miss having those apps to turn to on my phone such as when we were out and Jonny would go to the loo, leaving me to twiddle my thumbs and people watch without my phone to hide in. My morning’s have changed, I no longer waste the first hour of my day living through the updates of others. The social media ban has forced me to focus on my own life rather than comparing it to that of others. Mental health wise I’ve noticed a definite improvement to my anxiety. I’m finding it easier to have a positive outlook on things without thinking that I need to constantly share what I’ve been up to. I do think there are good qualities to social media, however. I’ve met some lovely people through social media, and the sewing community and the support/cheerleading therein are truly lovely by-products of it. Instead I’ve found myself with a lot more spare time which has been amazing. There’s been more listening to music, more being creative – knitting, sewing, blogging, journalling and reading. Things that feed my soul rather than draining it. I’ve also managed to finally declutter our home and create a calm home environment. Once I’d downloaded the apps again I had a mass un-following/muting session so that I only get accounts that bring positivity into my life. Do I feel happier? Honestly, I think I do. It’s empowering knowing that now I’m choosing when I want to access social media, rather than letting it become an all-consuming autopilot and that’s a really happy thought. How do you manage how much time you spend on your phone? I’d love to pick up any helpful tips you’ve got! Towards the end of November/into December I had a bit of a rough ride with my mental health. This culminated with me pretty much completely drained after 2 weeks of almost constant socialising and general people-ing. I’m an absolute homebody and very much need my quiet downtime to recharge! I did the usual end of year reflection and tried to pinpoint if there were any specific triggers that were making me feel worse. I kept coming back to social media. I’ve mentioned on here before my love/hate relationship with it but by December it was definitely straying into the unhealthy territory. After a lot of deliberation, and a serious wake-up call from my phone’s screen time update, I decided that I needed a complete social media detox. At one point I was using my phone for up to 5 hours on my days off, mindlessly scrolling through Instagram, Twitter and Facebook. Turns out that old saying is true: comparison really is the thief of joy. The more time I spent looking at the highlights reel of other people’s lives, the worse that I felt. Yet I didn’t seem to be able to stop myself. It’s something I’ve blogged about before more than once! The coming New Year gave me the final kick up the arse that I needed to do something about it. I didn’t want to enter another year feeling awful so on December 31st I deleted all social media apps from my phone and iPad. Day 1 wasn’t anywhere near as bad as I had been expecting. (The hangover probably helped me not wanting to look at a screen!) I spent the day curled on the sofa reading and watching trashy TV and didn’t miss stalking the lives of others at all. There was one moment during an ad break when I picked up my phone without thinking and opened up the folder where the Instagram app had once lived before I truly realised what I was doing. Slightly worrying that it had become so much of an autopilot for me. Day 2 was a real eye opener. Without social media apps to procrastinate on in bed, before I dragged myself out, I turned to YouTube. Now I very rarely watch vlogs at all and I’d certainly never watched any of the big YouTubers’ stuff. They’ve never held any appeal for me. That is, until that morning. I woke up, Jonny had left for work and I had an hour and a half to kill before I needed to be leaving. I spent an hour watching vlogs. AN HOUR. I even fell down a Zoella rabbit hole. I had never watched a Zoella blog in my life prior to then. I casually checked my screen time app and was honestly disgusted that I’d wasted that much time. And it was wasted. I gained nothing from it other than a feeling of disappointment that I’d not managed to instantly have a more productive morning routine. I deleted the YouTube app in order to avoid this happening the following morning. Days 3 and 4 were easier; I had high hopes that I’d be more productive with the removal of the apps that my scrolling had transferred to and it did work. I was starting to spend less time on my phone but I still missed stalking the lives of others. The weekend was far easier – we were away in London so had plenty of lovely distractions (including the incredible Harry Potter and the Cursed Child play!) A friend we met with did mention that she’d tried to find our how long we were in London for so had looked on my Instagram, only to find no posts which made me think I maybe need to live my life more rather than just posting about it on social media! Now I’m a week in and I’m honestly not missing it as much as I thought I would, it’s by no means easy but I do feel like I’m having a more productive January than I would have done otherwise. I’ve read 3 books already and had a massive wardrobe clear out! Have you ever tried a social media ban/detox? If so, how did you find it helped or what do you do to minimise your screen time? I’d love any ideas to help if/when I do feel ready to reinstall the apps. Happy New Year you lovely lot! Rather than make my usual super prescriptive resolutions (that I very rarely stick to) I thought about what I wanted more and less of in my life for the upcoming year. More time to be creative and less screen time were my instant thoughts. My self-enforced social media detox started yesterday and I’m already getting back on the blogging wagon with the extra time I’ve got! I’ll definitely blog about how that’s going at some point over the next month. New years are a funny one. As they approach I always find myself reflecting on the previous year and dreaming about the ‘perfect’ life I could have in the next if only I change a couple of aspects of my current routine. Of course, I know that this is very much a rose-tinted spectacle view of the world and that in reality I need to be less hard on myself and really think about being grateful for where I’m at. More gratitude is another thing I want to incorporate into 2019. Less comparison. Little things to get me back on track for a more positive year. For one thing, I’ve enjoyed writing this post and spending some time thinking about other future posts. 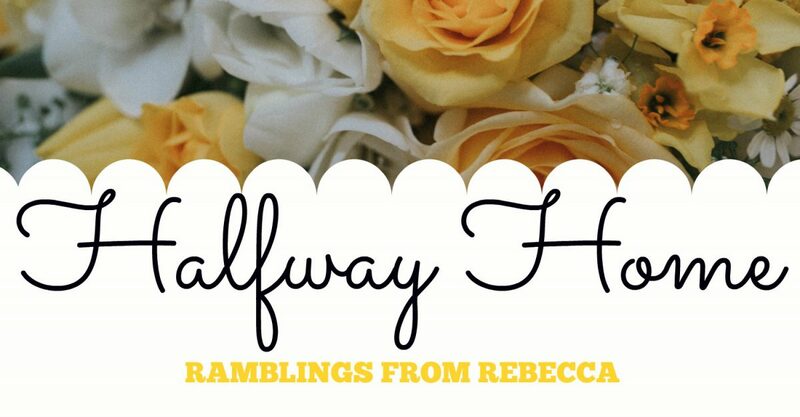 Author rebeccahalfwayPosted on January 2, 2019 January 2, 2019 Categories about me6 Comments on Happy New Year! Over the last year I’ve really struggled with anxiety. Not the ‘I’m a bit worried that I might miss the bus,’ type but the ‘What if I miss the bus, then I’m late for work, my boss will realise I’m not good enough to do my job, and oh my god, now there’s a crushing pain in my chest and I can’t breathe,’ type of anxiety. NOT a fun rollercoaster to ride. I have a secret board on Pinterest called ‘Misc.’ On it I pin everything I want to read/look back on at a later date. Five minutes mindless pinning here and there adds up and before you know it I have 100 random pins ranging from Chard recipes (I’m growing it and didn’t know how to cook it!) to how to clean a sewing machine. I know Pinterest admin sounds ridiculous but I honestly find that whiling away an afternoon working through posts, reading websites and deciding what to keep generally helps distract my mind from whatever other rubbish it’s trying to make me think about. Mainly the quick/easy tasks with instant results like deadheading flowers and impatiently inspecting the veg. growing wishing it would ripen faster! Added bonus being that the deadheading means our flowers are looking amazing for even longer. Who knew. Weirdly, given how little I’ve been keeping this spot up to date, the planning and writing of a blog post is something I really enjoy. My anxious brain pipes up constantly with the “What if no-one’s listening? What if nobody cares?” rubbish, but I know that deep down that doesn’t really matter. If it’s helping me then I should just crack on and do it! There’s something seriously cathartic about a morning spent cutting out new pattern pieces ready to be sewn into a new garment. I love the slow living element of sewing as you gradually get to see a new project come to life. You know, those niggly little tasks that you know you need to do but keep putting off. This week’s example being called the dentist to check my upcoming appointment times after I’d helpfully lost the card they were written on. I find it really satisfying to complete little things like this, once I finally force myself to. A cup of coffee and a quiet half hour works wonders to refocus my head. Bonus points if it happens outside or with an open window so I can hear the birds singing. This one’s fairly self-explanatory. Yes, I enjoy a Lush bath bomb but, for me, more important is a good book. I’m a fairly clumsy person so I have a designated ‘bath book’ to avoid any potential heartbreak caused by dropping-in-the-water related accidents. At the moment I’m currently working my way through Pride & Prejudice for the umpteenth time. I prefer a book I know really well then I can properly zone out in the bath. What sort of librarian would I be if this didn’t make the list? Books, magazines, blogs, any reading I can get my hands on. Note to self – must get better at commenting on all the lovely blogs I read! Taking photos is something I enjoy as it forces me to focus on something more productive than what’s going on inside my head. I enjoy it a lot and want to improve the quality of what I’m creating when I’m playing with my camera. My definition of what I class as self care might differ from yours, but it’s what works for me. What do you do to help find a positive head space? I’m always willing to embrace new ideas on the continual quest for a calmer self. It’s baby steps, but I’m definitely getting there.